Is your welder suitable for use with Retropol ? For all other destination countries, please email for a quote. 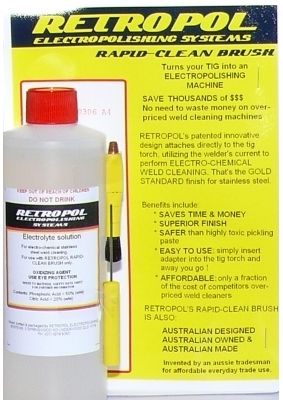 RETROPOL RAPID-CLEAN BRUSH turns your existing TIG WELDER into an ELECTROPOLISHING MACHINE, saving you thousands of dollars by eliminating the need to waste money on an overpriced weld cleaning machine that does the same job. The RRP of our starter kit is $195.00. 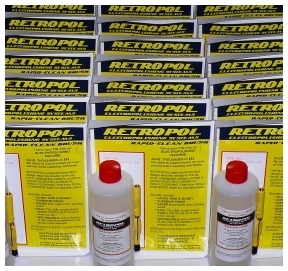 RETROPOL RAPID-CLEAN BRUSH STARTER KITS include everything you need to turn your TIG welder into a stainless steel electropolisher. One 500ml bottle of our specially formulated S/S ELECTROLYTE SOLUTION (RRP $20.00). Compared to a basic stand alone competitor unit, you're saving over $2000.00 to do the same job! 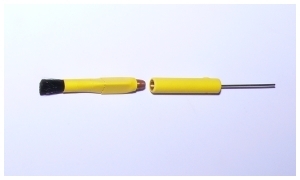 Retropol's patented innovative adapter attaches directly to the existing TIG torch the same way as a tungsten electrode. 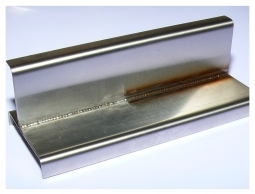 In seconds your TIG can be transformed into an ELECTRO-CHEMICAL WELD CLEANING MACHINE! Stainless Steel weld cleaning just doesn't get any simpler: Screw the LONG LIFE RAPID-CLEAN BRUSH into one of our PATENTED ADAPTERS, insert the adapter into your TIG torch, and you're ready to go in seconds. When you're done, simply remove the adapter and re-insert the tungsten electrode, and you're back ready for more TIG welding. SAVES TIME & MONEY: By utilising the DC CURRENT from your existing TIG WELDER, there's no need to purchase a dedicated overpriced weld cleaning machine (which retail for around $3000 to $6000). Your existing TIG is just as capable (with the help of one of our PATENTED ADAPTERS) of providing the same DC CURRENT required for electropolishing stainless steel - just like those mega-buck weld cleaning machines. Also, you don't have to lug around yet another heavy piece of equipment, which makes RETROPOL RAPID-CLEAN BRUSH even more suitable for site work. SUPERIOR FINISH: Electropolishing (and electrochemical weld cleaning) is the GOLD STANDARD treatment for stainless steel weld finishing. Mechanical sanding, followed by buffing and polishing has its benefits too, but in many applications, the tools just don't reach into tight corners, or even if they do, the time required to grind/sand, buff & polish is just too long for a decent result. Furthermore, mechanical means of finishing are incapable of achieving the same level of surface passivation at the molecular level as is achievable with electropolishing. Now, every tradesperson in the stainless steel industry with access to a TIG welder, can achieve surface passivation of stainless steel welds that were previously only available to those with the huge resources to be able to afford it. SAFER: than highly toxic pickling products. Pickling products typically contain an extremely dangerous chemical called HYDROFLUORIC ACID. Not only does it cause skin to turn an ugly orange colour, it is potentially LETHAL! Try googling 'hydrofluoric acid' and have a read of the wikipedia entry on this nasty substance. Many organisations and governments are banning the use of this chemical, due to just how dangerous it is - not only to those using it in industry, but also to the environment. There are safer preparations of pickling products now available, but the truth is, they really don't do a very good job, and there's still the need to wait forever for the paste/gel to take effect, and then the need to manually rub away the white 'halo' marks it leaves behind, not to mention the toxic environmental pollutant that needs to be disposed of afterwards. All these problems are avoidable when using RETROPOL RAPID-CLEAN BRUSH. EASY TO USE: Simply screw the long-life brush into the PATENTED ADAPTER, insert the adapter into the TIG torch and you're ready to go. When you're done, remove the brush/adapter assembly from the TIG torch, re-insert the tungsten electrode and you're ready for TIG welding again. Stainless steel weld cleaning doesn't get any easier than this. AFFORDABLE: At only a fraction of the cost of competitors over-priced weld cleaning systems, RETROPOL RAPID-CLEAN BRUSH now provides a quality affordable alternative. It has been invented, designed and patented by an AUSSIE metal-working tradesman, for affordable everyday trade use. Ask yourself this - "If there is now an alternative product that does a BETTER job, is much SAFER to work with, SAVES TIME, is ENVIRONMENTALLY FRIENDLY & is AFFORDABLE, why am I not using it?" Why don't you send us an email today!